In this post, I will use my win probability model to take a more detailed look at the ups and downs of one of the greatest NBA Finals games of all time. The Excitement Index of 10.1 quantifies how much the win probability graph travelled over the course of the game (more movement = more excitement). The Comeback Factor of 199 means that, at their lowest point, the Heat's chances of winning the game were 199 to 1. MVP designates the player with highest Win Probability Added (WPA) for the game. LVP (Least Valuable Player) designates the player with the lowest total WPA. Hero and Goat do the same for my clutch WPA stat. Note the symmetry between MVP Ray Allen's +41.3% WPA and LVP Manu Ginobli's -41.3%. The Heat began their final possession of regulation down 3 points with 19 seconds on the clock, which works out to a 12.2% win probability (more on how they got there later in this post). The Heat burn about 10 seconds off the clock getting the ball upcourt and into the hands of Lebron James. Lebron takes a three point shot from nearly the identical spot he had hit one not 15 seconds earlier. And misses it. The Heat's win probability drops to 2.9% (-9%). But note this is before the rebound. We have a Schrodinger's cat situation here, with the Heat's possession neither alive nor dead. Missed field goals are rebounded by the offense 36% of the time, and the 2.9% win probability reflects that. If the Heat retain possession, their win probability inches up to 5.6%. If the Spurs get the rebound, the Heat are nearly toast at 1.0%. The 3-point territory in the corners isn’t exactly cavernous. You have maybe three feet in all. Misjudge it one way and you’re touching the line, costing yourself a point. Misjudge it the other way and you’re out of bounds. Lebron James has never been this open in his entire life. And there is plenty of time on the clock. He's begging for the ball. Ray Allen, falling backwards, seeking that sliver of court between the three point line and the bench, is surrounded by literally all the Spurs. And he still hits the shot. Watching Norris Cole on the sideline bouncing like he's on springs never gets old. A game tying three to force overtime in the NBA Finals is going to be memorable regardless. But that shot was the culmination of a pretty improbable comeback. We've all heard the stories of Heat fans being denied re-entry to the arena, having left the game when all seemed lost. So, when did that nadir occur? How low was Miami's low point? Stop me if you've heard this before. The Heat hit a three point shot late in the fourth quarter after rebounding a Lebron miss, keeping their title hopes alive. This actually happened twice in the final 30 seconds of regulation. We covered the second occurrence above. The first occurrence happens to be when the Heat's chances were at their lowest. With the Heat down by 5, Lebron takes, and misses, a three point shot. Their win probability drops from 2.1% to 0.5% (or 199 to 1). As with the Lebron miss that preceded Ray's shot, this is the win probability prior to knowing who secured the rebound. If the Heat retain possession, their win probability is 1.3%. 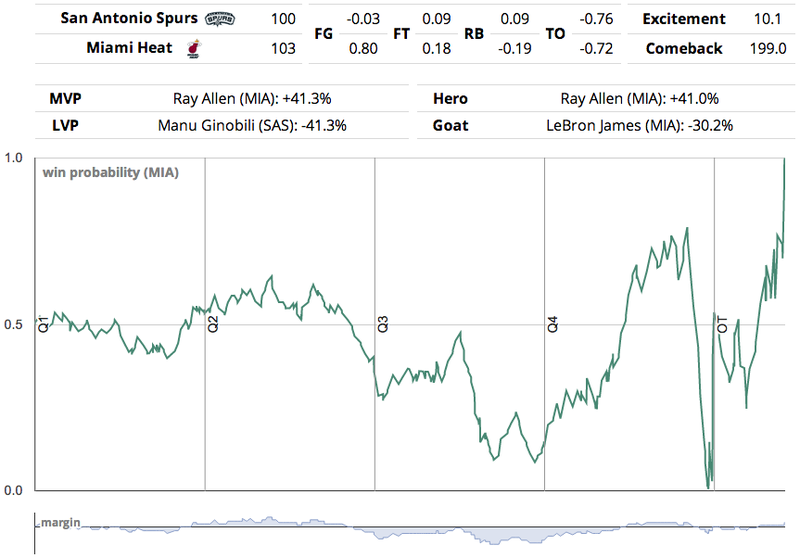 If the Spurs get the rebound the Heat effectively flatline at 0.1%. The ball caroms, plinko-like, off of several players before Mike Miller grabs the rebound near the wing. The Heat's win probability inches up +0.8% to 1.3%. They still have a pulse. 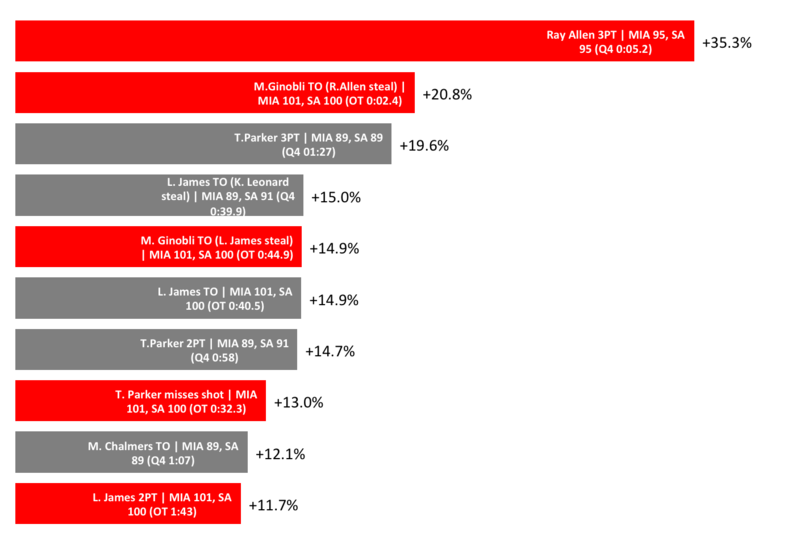 Miller quickly shovels the ball to Lebron who, like an artillery gunner recalibrating his angle of attack, redeems his prior miss and hits the three point shot: Miami is now down by two, the Spurs have possession and the Heat win probability is 8.8%. Down by 2 and with the shot clock off, the Heat quickly foul Kawhi Leonard after the inbounds pass. Leonard had a strong game that night, and a fantastic series in general (his win probability added for the Finals led the Spurs, and was second only to Ray Allen's). But Kawhi missed the first of his two free throws (the worst one to miss since there is no rebound opportunity), allowing the Heat to get the ball back with a chance to tie. That free throw miss increased the Heat's win probability from 8.5% to 14.7%. It dropped to 12.2% when Kawhi hit the second free throw, setting the stage for Allen's heroics. In seven successive plays (and just 83 seconds of game time), the Heat's win probability tumbles from 79.2% to 2.3%. And note that the Heat never even get a shot off. Their three possessions during this time all end in turnovers. I haven't really covered overtime in this post, but four of the top ten plays occurred in those final five minutes, including the number two play: Manu Ginobli turning the ball over with the Spurs down by one and just 2.4 seconds left in overtime. Manu was clearly hoping for a call as he drove to the basket, but the whistle did not come. Through the first three quarters, Lebron played poorly, with a WPA total of -13%. 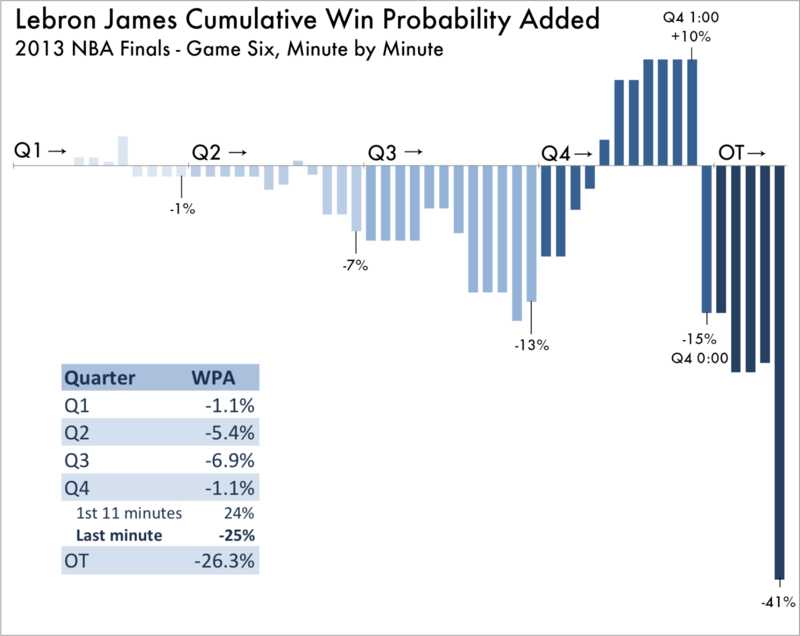 However, things turned around in the fourth quarter, as James added +23% in win probability through 11 minutes. But win probability is unforgiving in the final minute of a close game. Two turnovers and 1 for 3 shooting in that last 60 seconds wiped out 11 minutes worth of solid play, and he ends regulation with a -15% total. He did not fare any better in overtime, digging an even deeper hole on 1 for 3 shooting (once again) and another turnover in the final minute. Of course, you tend not to hear much about Lebron's performance in game six because the Heat won. But imagine if Bosh doesn't get that rebound, or Ray Allen misses that shot, or Ginobli converts that drive in the final seconds of overtime. I have got to think the prevailing narrative would have been that Lebron choked away his team's chances for a second title. That's probably not fair to Lebron, but sports media narratives rarely are. Case in point: see Chase Stuart's brilliant takedown of the prevailing narrative surrounding Peyton Manning's "legacy". Without that game six comeback, Lebron would be sitting in a very Peyton-like spot: "only" one ring, a losing record in championship series/games, and the impression that he doesn't have what it takes to turn regular season success and impressive box score stats into championships for his team.